This vintage '50s aqua lace jacket is 55% acetate and 45% nylon facing with a 100% acetate backing. It has raglan sleeves and a band Asian style collar. 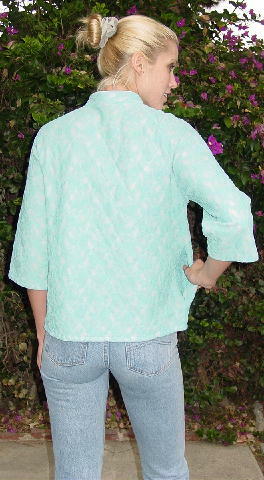 There are 4 white pearlized buttons down the front and 3/4 length sleeves. It was originally from a stylist's collection, and was used in photo shoots for pictures for models' portfolios. Recently a model wore it with jeans or with a dress when she was going out. neckline to end of sleeve 21 1/2"